To celebrate the inauguration of Opening A Window: The Andrew W. Mellon Fellowship Program, the collection spotlight for this month highlights relevant scholarship on the conservation and preservation of textiles. The formal name of the Mellon program comes from the jargon of the conservation profession where a small sample site for testing is identified and described as “opening a window”. This major grant from the Andrew W. Mellon Foundation allows the Heard Museum to provide paid, hands-on opportunities within the museum for nine months each over the next three years. 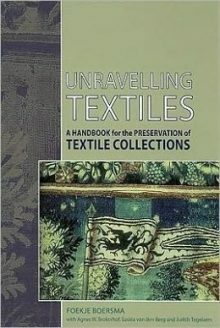 For the Heard’s three new Mellon fellows or anyone interested in collecting, preserving or conserving textiles, these four examples from the library collection are currently on display in the public reading area of the library. Please feel free to visit the library to review these or any other items of interest in the library and archives collections. For more details or additional collection information, click on the Search Catalog link located in the pull-down menu of the library tab on the Heard website.